Over in the Facebook Group, we’ve had a few questions about how beginners can gear up for backpacking and mountaineering without going broke. So I thought I’d do a round up of all my favorite workarounds, cheats, and discount outdoor gear websites. If you want to watch me being a spaz, definitely check out the video above. Or if you’re more of a textbook kind of person, dive into the transcript below. Don’t forget to add your own tips and favorite discount gear sites in the comments! I love hearing from you and learning something new. Hey! How y’all doing? As promised, I am here to talk to you about how and where to buy cheap hiking gear. Who doesn’t want that? Actually, before we even get into cheap, for those of you who are just starting, like maybe getting into sports like backpacking and mountaineering, one thing I really try to encourage people to do is not to try to buy everything all at once. The stuff’s potentially expensive, it gets very overwhelming. You don’t need to go out to REI and put a second mortgage on your house to outfit yourself to do a backpacking trip. For your first few trips, try to borrow all the gear that you can, other than maybe your clothes and your boots. If you’re going backpacking with a friend, obviously they’re gonna have things. You can share a tent. You can share a bear canister. Maybe you can share a sleeping bag, if they’re a really good friend. There are many other things that can be used by a group like water filters and stoves. If you have friends that are into backpacking who are going with you, they are usually pretty happy to bring them along and share. In return, you can offer to carry some of the group gear. Use your social networks to see if anyone has what you need gathering dust on a shelf. One I’ve found that works really well is a neighborhood one called NextDoor. You can go on there and ask things like, “Hey, I need a bear canister just for this weekend. Does someone have one I can borrow?” A lot of times people will loan you things, no cost involved. I still have it. I’m actually taking it backpacking this weekend. So it really does pay to borrow. If you’re not quite ready to commit to buying expensive gear, think about renting. REI and many local outfitters and gear shops have rental programs. The great thing about renting is that it gives you an opportunity to try different kinds of equipment. I rented a bunch of different kinds of cross-country skis before I finally bought some. And I actually bought the same model that I rented. Most places that rent gear sell it at the end of the season or at the end of every two seasons. So you ask them, “Hey, can you tell me when the rental sale is?” And then go, get you some gear. It’s usually very inexpensive, because it’s used, right? I have a friend whose goal is never to pay more than 50 percent of retail for gear. And I think that’s actually not super unrealistic. There are just tons of places to get good, inexpensive gear, so I will share a few with you. So you can buy their gear. It’s awesome. Here in Colorado, and I suspect in other outdoor destinations, a lot of tourists dump outdoor gear that they don’t want to take home. So you can just go to like Goodwill and pick up really nice fleeces and tech jackets. And even skis sometimes. It’s crazy sometimes what you find at Goodwill. Sometimes you don’t find anything, but definitely check it out. Bonus tip: If you’re going on vacation to an outdoorsy place, definitely swing by the thrift shop and pop some tags. No, don’t steal stuff, but definitely check it out. If you live near an REI, definitely get on the email list for the garage sale. Because you know how you can return everything to REI within a year? It’s actually a really nice policy, right? When people return gear, REI can’t really put it back on the shelf and sell it new. So they have what’s called a garage sale where they sell all their returns that are often very lightly used. You can get amazing deals, like an Osprey backpack for half price. Again, it’s kind of a crapshoot. Sometimes it’s awesome, and sometimes you really don’t find anything. But you’ll never know if you don’t go. If you’re a fan of discount outdoor gear, one website worth joining is called The Clymb. 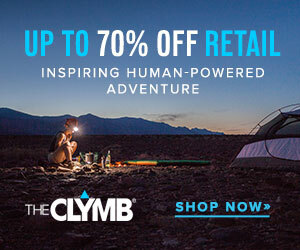 The Clymb holds 72 hour flash sales where you can buy gear for up to 70 percent below retail. Sales feature select items from brands like Mountain Hardware, Keen, Black Diamond, Outdoor Research, and more. To take advantage of these, you need to join the site. You’ll then receive emails about new promotions. 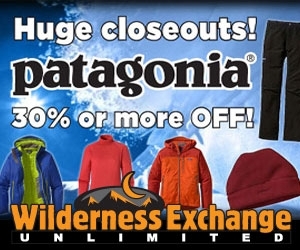 The plus side: The Clymb is a great way to snag discounts on outdoor gear that rarely goes on sale. One potential downside: if you want something specific, you have to be patient and wait for what you want to come along. So it’s best to go into it with an open mind! Want to check it out before you register? Use my affiliate link to have a look around The Clymb. A lot of my mountaineering students really love Sierra Trading Post. It’s a retailer (stores and online) that sells a lot of closeouts (older products that didn’t sell) and “seconds,” which are products with slight cosmetic flaws. Their deals kind of range. Some of their stuff’s almost full price, and some of it’s super, super cheap. Other outdoor gear discount websites to check out: CampSaver.com and Steep & Cheap (which is affiliated with Backcountry.com). Not ever outfitter or gear store does this, but it doesn’t hurt to ask. Some outdoor clubs and outfitters will partner with retailers to provide discounts to members and students. For example, when I was a mountaineering student through Colorado Mountain Club, I got a 10 percent discount at Bent Gate Outfitters in Golden. And when I went on to become an assistant instructor for that class, I got a slightly better deal. It’s not the deepest discount on earth, but it helps! 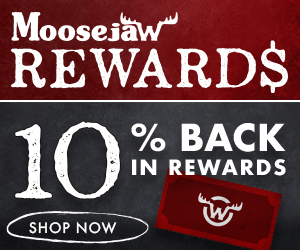 Moosejaw is an online retailer of The North Face, Arcteryx, Patagonia, Mountain Hardware, Sierra Designs, Big Agnes, and many other top outdoor brands. So how do they save you money? Three words: awesome rewards program. Get 10% back on full-price items and 2.5% on sale items. And you can apply this credit any time you buy. These savings really add up, so be sure to sign up! You also get free 2-day shipping on orders over $49. Eventually, some of you are going to come to a point where you’re going to want to buy a lot of gear. You’ll get into multiple outdoor sports. Or you’ll get into mountaineering, which, holy balls, there’s so much gear to buy. You obviously want to spend the money on trips, not on the overpriced gear. So what do you do? REI actually has a credit card that gives you dollars back in your dividend. But if you do, I’ve had friends who got back $700–1,000. And I’m sure some people get a lot more than that. So that’s a thousand dollars of gear just for paying your bills and buying stuff you would anyway. By the way, you know you’re in Colorado when you’re at a restaurant, and everybody pulls out their credit card to pay the bill — and they’re all REI credit cards. Happens all the time. I’m hopefully going to move to Mexico part-time in the next couple of years, but I will still be a Colorado Mountain Club member. Why? Because for my $75 membership fee, I get pro deals (40–60 percent off) on a ton of brands. Some of them even have free shipping. Pro deals do have some restrictions on what you can do. You can’t buy for friends or family. All sales are final, so you really do have to know what you’re going to get. But once you’re in their pro deal program, you basically go to a website called ExpertVoice. And then you look at all the brands available and buy what you want. It’s amazing. You can buy bicycles. You can buy a giant rack for the roof of your car. I just got a big shipment of Mountain House dinners. It’s like my supply for the year. And that’s all through my pro deal at Colorado Mountain Club. So even if I never did anything else at Colorado Mountain Club, I’d probably make my $75 membership fee back in a month just on gear savings alone. So there you have ’em. 15 places to get free, cheap, and discount outdoor gear. Do you guys have any tips that I haven’t covered? I know you all are outdoors people. You buy some GEAR. If you’ve got another good place for your fellow dirtbags to shop, go ahead and drop it in the comments. And if you have gear questions, definitely hop in the Facebook Group and ask away! Originally published August 6, 2018. Last updated Sept. 20, 2018. Hello I am jeff and am new to backpacking I was able to get some of my stuff from amazon after careful research on the stuff I was getting. I was able to get most of my stuff. And have not had any problems with it. I have found that spending money for name brand stuff is good If you know where to spend it. And some stuff just because it’s not name brand does not mean it’s not any good.